Gambling in a casino or online often presents the bettor with a chance to use a range of skills and strategies in a challenging and exciting environment. Roulette, while certainly a game of action and excitement, is one where strategy as it is normally understood doesn’t play a major role. However, there are some steps you can take and theories you can incorporate when betting that will help make your roulette experience more enjoyable and, hopefully, lead to more money being shipped your way. One of the running jokes in the gambling world is the idea of a “roulette system.” Roulette is one of the oldest casino games known to man, stretching back to 17th century France, and in that time thousands, if not millions, of people have tried to come up with a system that would shift the edge away from the house and to the player. While there are systems that can improve one’s odds slightly, there is no specific system you can use to beat a roulette wheel. So if someone promises you a magical strategy that will lead to riches at the table, treat them with the same kind of skepticism you would reserve for an offer to join a Wall Street ponzi scheme. The few useful roulette systems don’t apply to how you pick your numbers, instead they are about where and when you place your bets and, most importantly, the size of those bets. As with most gambling strategies, roulette systems rely on probabilities. If you’re serious about playing roulette, and want it to be a game you stick with and enjoy over the course of time, don’t alter your strategy. If you’ve chosen a reasonable system, it will work out for you as well as it can as long as you give it a real chance. When the inevitable run of a few bad nights does occur, instead of changing systems try color coordinating your clothes or picking up a lucky rabbit’s foot. One of the most simple systems to use in roulette is also the one that requires the largest bankroll. It’s called the Martingale system, and it originated as a strategy for blackjack. Basically, all you have to do is double your bet after each loss. Theoretically, once you do hit, you will win enough to cover all previous bets. The problem with the Martingale system is that it might take several spins of the wheel before you win, in which time you could lose your entire bankroll as you keep upping the bet. For that reason, if you decide to employ this strategy, make sure to start with the smallest bet allowed at the table and try to have as big a bankroll as possible when you start out. The Martingale betting system starts over again with each winning bet. Labouchere is a progressive betting system, much like Martingale, but it doesn’t involve risking large sums as quickly. In theory, if a player using this system wins more than a third of their bets (18/38), they will come out ahead. You start by writing down a series of numbers in a line and then use those as the basis for your bets, typically adding the numbers at either end of the line to determine the bet amount. After a win, the bettor crosses out the numbers they used and continues to proceed working off the shortened list. After a loss, the bettor adds the previous bet amount to the end of the line and proceeds. The Labouchere system is based on setting your winning goal ahead of time. The system then divides your bets into different amounts based on whether you win or lose. The D’Alembert system was developed by the 18th century French theoretical mathematician Jean le Rond d’Alembert. It is a simple strategy that is designed to limit the amount of bets and losses. Simply stated, with this system you add one “unit” – a pre-determined sum chosen based on the size of your bankroll – to your bets after a loss, and subtract one unit from your bets after each win. The D’Alembert betting system adjusts the bet lower for every win and higher for every high loss. 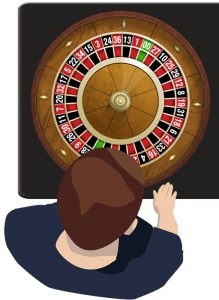 The only roulette strategy that has ever been shown to work on a regular basis has been nullified by modern technology and casinos’ awareness of its use. Throughout the history of modern gambling, some players have been able to track certain roulette wheels and find out which quadrants the ball is most likely to land in. This requires an older wheel where the pockets have worn down, creating deeper valleys where a wheel might settle more often, and days, if not weeks, of intense observation and recording of results. Since casinos have become aware of this possibility, roulette wheel manufacturers have solved many of the engineering issues that led to the problem in the first place, and pit bosses and croupiers now keep a closer eye on those wheels for the wear and tear that might lead to it happening. At this point, tracking a wheel might put you in a better position to win, especially online where the past results of a table are much easier to access than they are at a live game. In that case, you can at least contemplate where the roulette ball seems to land most often. In the end, the best roulette strategy might just be picking your favorite numbers. At least that way, when you win you can credit some sort of preternatural understanding that only you possess. Use your birthday, the dates of your wedding, your pant measurements (if they’re small enough) or any other number that feels lucky to you at the time. You can’t go wrong, since the actual picking of the numbers will have no strategic impact on the outcome of the game. So, if you decide to spend your evening at the roulette table, remember that it should be all about having a good time, and when it comes to controlling your destiny in terms of winning and losing, it’s up to the gambling gods to smile down upon you. There’s not a whole lot you can do.